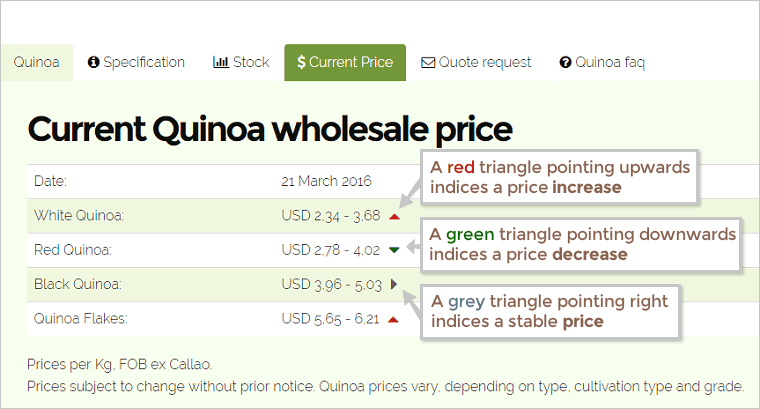 With the new real-time quinoa wholesale prices overview, buyers and importers can quickly research and compare the latest wholesale prices. The prices are based on real-time market information and are updated automatically. OrganicCrops is the first company offering transparent quinoa market prices. OrganicCrops can put together a tailored quote for your quinoa product requirements. On the Quinoa wholesale page click on the 'Quote Request' tab and fill out the quote reuest form to receive detailed product pricing according to your requirements. Another new feature on organiccrops.net is the Quinoa Wholesale Price Alert (QPA). It informs you of the wholesale price changes by send you an email. This way you’ll stay informed of the latest quinoa whole price developments. To subscribe to the QPA, simple enter your email address in the email field and click on ‘Subscribe’. You’ll find the QPA subscribe function on the Quinoa wholesale page, under the ‘Current Price’ tab.